MINNEAPOLIS Federal safety investigators intensified their scrutiny of a fire aboard a Boeing (BA) 787 as concerned investors sold shares in the aircraft maker for a second day. The plane maker on Tuesday confirmed that the fire aboard a Japan Airlines plane on Monday appeared to have started in a battery pack for the plane's auxiliary power unit. The National Transportation Safety Board described the fire damage to the battery as "severe," and said it is sending two more investigators to examine the Japan Airlines plane. It also formed investigative groups to look at the plane's electrical systems as well as the fire response. Boeing has a lot riding on the 787. The long-range jet promises a smoother travel experience and is 20 percent more fuel efficient than older models. After years of delays, Boeing has now delivered 49 of the planes, with almost 800 more on order. The fire on Monday happened on the ground at Boston Logan International Airport, with no passenger on board the plane. But an in-flight fire can be catastrophic, so the matter is receiving close scrutiny by aviation authorities. Interest is especially high in this fire because of indications that lithium batteries - which generally have not been used on large planes before the 787 - can burn very hot, with fires that are difficult to put out. The NTSB said it took firefighters 40 minutes to put out the fire near the back of the plane. JAL spokeswoman Carol Anderson said the airline inspected its 787s after the fire. She declined to discuss the results, but noted that no schedule changes were made as a result of the inspections. United Airlines (UAL) said it inspected its six 787s overnight. A spokeswoman would not say what the inspections found. Electrical problems have been the 787's nemesis. Last month, a United Airlines 787 flying from Houston to Newark, N.J., diverted to New Orleans because of an electrical problem with a power distribution panel. Last week, United said it would delay the start of 787 flights from Houston to Lagos, Nigeria because it wanted to "improve the reliability of the aircraft." In November 2010, a test flight had to make an emergency landing after an in-flight electrical fire. The fire delayed flight tests for several weeks while Boeing investigated. Boeing said the fire on Monday appears to be unrelated to previous electrical problems on the 787. "Nothing that we've seen in this case indicates a relationship to any previous 787 power system events," Boeing said in a prepared statement. Those earlier problems involved power panels elsewhere in a rear bay for electrical equipment. Boeing also said it "would be premature to discuss additional details at this stage" of the investigation. Boeing said it has shared information about the prior events with the NTSB. Shares of Chicago-based Boeing have fallen 4.6 percent since the fire was reported, wiping out almost $2.7 billion of the company's value. On Tuesday they fell $2, or 2.6 percent, to close at $74.13. Investors may have been unnerved by the fire after it appeared that the mechanical and manufacturing kinks with the 787 had been worked out. They may have also reacted to another 787 issue on Tuesday. 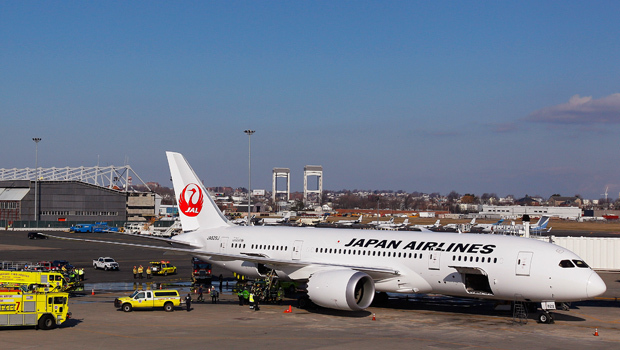 A different Japan Airlines 787 at Logan had to be towed back to the gate after spilling 40 gallons of jet fuel. The flight was re-scheduled for later in the day.